A dear friend that I call Homeslice recently took a trip to Peru and on her return, she surprised me with this freshly roasted bag of coffee (and when I say fresh, I mean FRESH – it was one day younger than the freshest coffee I had brought home from my trip to San Diego)! According to the Coffeesphere page about Top Coffee Shops in Lima, Tostaduría Bisetti is located in the Barranco district in Lima and was started in the 1950s by a Peruvian with Italian roots named Rómulo Bisetti. 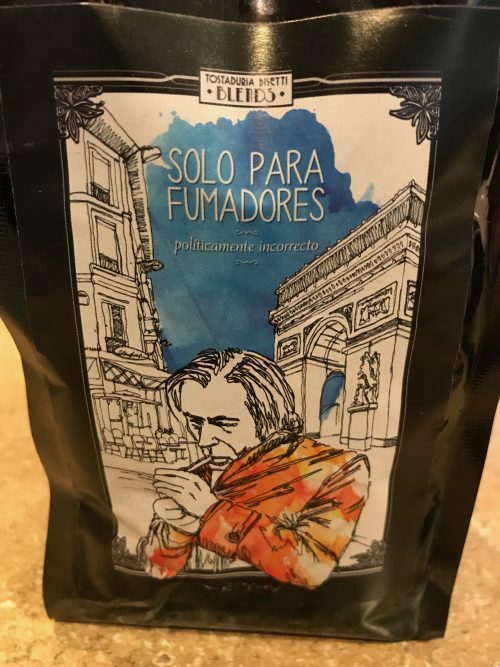 This blend, “Solo para fumadores” (Only for smokers) is one of their three most popular items at their cafe, and it gets its name from an essay by writer Julio Ramón Ribeyro (1929-1994). The writing is beautiful and evocative so I’m going to post it in both the original Spanish and in an English translation, but in short, it is all about sensory pleasure, and isn’t that exactly what enjoying a great cup of coffee is all about? ¿Qué tipo de recompensa obtenía del cigarrillo para haber sucumbido a su imperio y haberme convertido en un siervo rampante de sus caprichos? Se trataba sin duda de un vicio, si entendemos por vicio un acto repetitivo, progresivo y pernicioso que nos produce placer. Pero examinando el asunto de más cerca me daba cuenta de que el placer estaba excluido del fumar. Me refiero a un placer sensorial, ligado a un sentido particular, como el placer de la gula o la lujuria. What kind of reward did I get from the cigarette to have succumbed to his empire and to have become a rampant servant of his whims? It was undoubtedly a vice, if we understand by vice a repetitive, progressive and pernicious act that gives us pleasure. But examining the matter more closely I realized that pleasure was excluded from smoking. I refer to a sensory pleasure, linked to a particular sense, like the pleasure of gluttony or lust. V60: This tasted really dark and strong – it was a bit much for me straight but I enjoyed it with just a tiny bit of sugar added to soften the really spiky edges. This was the only time I added sugar in this tasting. AeroPress: This had a satisfying dark flavor without any bitterness. It was a bit brighter than the later French press cup so it kept my palate awake more. Chemex: Nice! Caramel and chocolate notes abounded, with a touch of toasted nut and charred wood. French press: Less flavor complexity in this cup than the others but very smooth in texture with a rich mouthfeel. Summary: Bisetti managed to get very dark and rich flavors into this blend without overroasting the beans or making them oily or bitter. This blend works well in a variety of methods but I think it suits immersion methods like the French press best, because in my opinion, the rich flavors + the natural oils really leads to the sort of cup that lingers in your memory long after it’s been consumed. Even if you can’t remember the exact flavor, you’ll remember everything about how the moment made you feel, and you could spend the rest of your life chasing that feeling. Thanks, Homeslice, for bringing me back this delicious coffee!! I almost feel like I was on the trip with you!